RoboCop Trailer: Is He the Hero Detroit Needs? When I heard they were remaking this movie, I was excited because my brain translated "remaking" as "updating", somehow expecting the exact same film but maybe with better special effects. The first minute of this trailer got me very excited, thinking "Oh! They didn't go with that stupid black suit! They kept the old one!" and then....well...see for yourself. Why won't Wolverine see things my way.....? Yes, the movie seems stuffed with guest stars spouting off "perfect for the trailer" dialogue while my expectations get lower and lower by the moment. I really don't understand how they didn't think "Does it come in black...?" has BEEN DONE. I think more than a few people saw Batman Begins, as well as that exact line being in the trailer in reference to the updated Batmobile (aka the "Tumbler"). 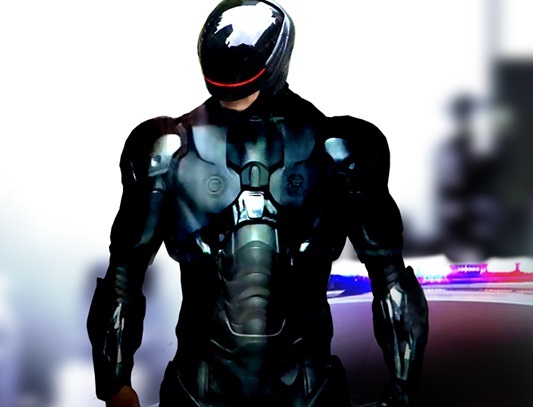 The original Robocop design is sah-weet(!) and it's so iconic that to tease us with it and then take it away is borderline cruelty! This new black suit design is Cyclops (post AvX) meets Daft Punk meets Tron after bumping into a Cylon. How many movies have we seen where the bad guys, or even the good guys, are dressed all in black, or the teams of henchmen are all black-suited? This design does not stand the test of time (that "time" being the length of this movie). I personally have a huge problem with CGI and gravity. I don't know why nobody seems to be working on giving CGI characters realistic "weight" to them. There are several shots in this trailer that look like a 90's video game with better pixelation. There are also robots in this movie. Lots of robots. I don't remember the original movie's tension coming from Robocop shooting a bunch of robots but from the fact that he wrestles with his actions towards humans while trying to maintain a grip on his humanity. This version seems like he's kept his entire personality and may as well be "Iron Man" but the twist is that he was forced into the suit. Despite his ridiculously unending list of physical ailments (the original just had a chest cave-in, this version was basically put through a shredder that was on fire and laced with a new strain of the plague). I'm being harsh, I know, and many of you were likely born post-Robocop I and your first introduction to the character may have been his jetpacking antics in Robocop III. I won't hold it against you so let me have it! Comment below and tell me how wrong or incredibly right my knee-jerk reaction to this trailer is.